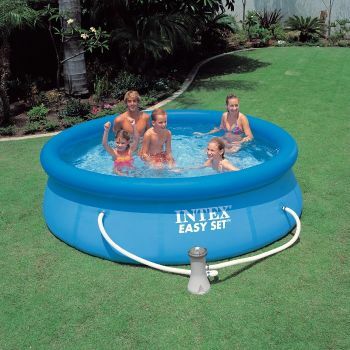 The Intex Easy Set Pool is manufactured using the highest quality PVC, and is several times stronger than the other makes available on the market due to the close-weave nylon webbing that is used for re-inforcement. The 18ft x 42", and 18ft x 48" Easy Set Pool PACKAGES are supplied with the same items as the 15ft but without the surface skimmer. An Optional Upgrade on the 18ft pools is the new Krystal Clear Deluxe Saltwater System. This allows pool owners to eliminate the costly and hazardous use of traditional chlorine. There's nothing like swimming in completely fresh, clean, crystal clear water! The pool's water is automatically converted into an effective algaecide by simply adding the recommended dosage of salt directly into the pool. The Krystal Clear Deluxe Saltwater System includes a 2000 gallon/hour (7570 litres) filter pump set. The system includes a touch-sensitive control panel that allows pre-programmed operating hours, and also incorporates a keypad locking system to prevent accidental alterations. A flow-sensor system also alerts any adverse operating conditions and there is a self-cleaning titanium-coated electrolytic cell for continued performance.